It is a day where things are not working out, be it home or office. You step out of your house and you face issues with your car. You go to buy a particular item which is always available but today it is not! You left on time, but you arrived quite late for office that led to you being absent for an important meeting. You are hungry and you arrive at your favourite restaurant only to know that it is closed for the day! What a lousy day isn’t it? How to Handle a Bad Day? There is a misconception that if you are having a bad day then treat yourself with something nice to lift up your spirits. Treating yourself is like consuming alcohol, you get into a happy zone but as the day passes the happy zone can become into a frustrating zone. You can eat chocolates, have beer or ice creams or smoke to make yourself happy at that moment but not for long. Your feelings come back to you and you begin to feel more frustrated and angry with yourself. Try and resist on the thought of making things better by having a treat! A positive behaviour towards others can make you feel nice and turn your lousy day into a peaceful day. By helping others you receive positive vibes which can lift up your day. If you are having a bad day, ensure that needy people around you are having a time of their life because of you. When you see someone happy because of you, it feels nice as your feel content. So, go ahead and help others to help yourself! The more you think of having a bad day, the worst it gets. What can you do when you are having a bad day? Go see a movie or do something that you like! Enjoy the day with your hobby so that you get some relief in the day. Your mind gets rejuvenated and your lousy day also gets over with it. Take a break, get some peace and restart your day! You can start working on your pending items at home or at workplace. Tidy up your cupboard or work table by organizing things and making look neat. A neater and cleaner place always lifts up your spirit and down goes the lousy day feeling. You feel nice to have a nice cleaned desk where you can work easily. It is a nice exercise to lift up your mood from the dead! We do a lot of work in a day, out of which some work and some don’t. Do something which you have not done in a long time to feel accomplished. You can go to the gym which you might have missed, get back to your reading which you might have stopped, take the dog out for a walk which you might have avoided and many more. Once you complete the task which has been pending for long, you feel nice to scratch that off the list after all! So, look out for small pending work and complete it! As humans we tend to get into our shell when we are having a bad day. Being alone means pondering on it all the time and hence, making your mood from bad to worst. Call up your friends, have a little chit chat or a small get-together to talk about your day and theirs. It is a good mood lifter as we tend to get diverted and move to fun conversations that lead to good time. So, don’t get into your shell but get out and get in touch with your close ones. You needn’t be a singer or a musician to enjoy music. Any layman person can be a music lover. Play your favourite band and grove to their music. Sing along and your mind soon gets distracted from all the negativity that happened during the day. Music connects with your inner soul bring you peace and harmony. We take shower to clean ourselves from all the dust and bacteria. So, to clean your day of the negativity, wash it away from your body. What is an effective way to do so? Well you can alternate between hot and cold water as this will circulate blood rejuvenating your mood. This is a best way to lift your spirits. Animals sense when humans are not in their mood and strive really hard to get them in a better place. You can pet an animal and feel their love every time they lick, roll or jump at you. Both of you need each other and help each other to be positive. Many therapists with the help of animals help in increasing positivity and behavioural changes. If you do not own an animal then look for one in the neighbourhood or you can even go to animal shelter. You can hug out your problems and it is quite effective. If someone shares their worries or issues with you and in turn you hug and pat them then it can soothe them down. A hug means a lot and conveys a lot of positive energy. It conveys that you are there for the person and will support him through this day. Phrases like “it’s ok” or “Leave it let’s go out and have some fun” with hugs do cheer up the person on the receiving end. It is not necessary that you should have writing skills to jot down what happens in the day. Take a break, bring in your pen and paper and mention what went wrong during the day that bothered you as sometimes bad things happen. Once you are done with bad things, it is time to feel grateful to bring in positive vibes back. Writing it down is like shouting out loud when no one is looking. It is not necessary that someone should read it, but writing it down gets the bad energy out of your system. Exercise is a healthy option to vent out your frustration. You can hit the gym with full vengeance and flush out the toxic energy. It can be a long job with music on, or light weight exercise at home or breathing exercise. This will get you out of your chair and your mind will get occupied by doing a physical activity. Once you are done, you feel better and energized. You need to stay away from social media so that you don’t get bothered on how they are spending their day. You feel more depressed more when you come to know that compared to others, you are having the worst day. So, step back from social media, you will not lose out on anything if you are invisible in the digital world for some time. Sign out from the digital world and live in the real world without wondering what others are doing. It is one of the methods with hypothetically only women use to cope with something or get out of their bad day. There are many men out there who love shopping and also feel that it works like a therapy to lift their mood. Shopping is an expensive therapy but it works 100%. Just hit the shops, pick what you want- be it for yourself or others. There is no good excuse to shop, so stop thinking over it and distract yourself and get lost in the mall. Your entire day was not as it was meant to be and has put you down in your spirits. You do not have any energy left to do anything physical or mental. So how are you going to help yourself out of this? It is simple call it a day early, have an early dinner and go to your beauty sleep. The next day is a new day with new energy and new opportunities. If you love funny videos or movies, then go for it. Watch it in the comfort of your home or go and watch in a theatre. Funny jokes and situations that you see in the visual will make you forget about the bad things. Nature solves most of the problem; the smell of unpolluted air refreshes your mind and gives you peace. Go for a walk in park or nearby trek area. You can walk barefoot on the grass and let the mother-earth absorb the negative energy from your body. Nature gives you the peace and positive attitude all long and you tend to think clearly. So go ahead and walk all your worries away. Every human holds on to a memory that helps him or her to lift up their spirits in dark times. It can be a childhood video where you can see your goofy and naughty side. You can go through a fun-filled photo album remembering your care-free days. You can also just talk about your past with friends and family to refresh the happy moments of your life. So, go down the memory lane, live those happy moments and lift up your mood. Anyone can have a lousy day any time, but whether you want to stick to the bad day or come out of it is a personal decision. You cannot change your mood until you want to. Follow an activity that suits you best for the day and lift yourself up from a lousy day. Don’t allow a negative vibe to take control of your day and spoil it to the fullest. 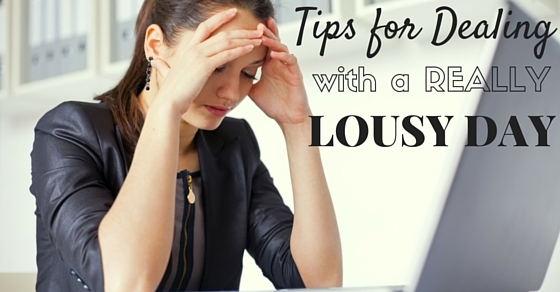 Make the Lousy day feel lousier for not affecting you! Previous articleCried at Work in front of my Boss – How to Recover?